In this App review, I am reviewing this app that should be with every dental student or medical student, an app that gives the 3D human skeleton. Essential Skeleton contains a full 3D skeleton model which can be rotated at any angle. View bones in isolation, listen to audio pronunciations of bones, annotate & share media and even take quizzes. This app is being offered free to demonstrate the groundbreaking 3D technology and innovative design inherent in Essential Anatomy 3. New 3D technology via 3D4Medical’s latest graphics engine. Dynamic quiz function – Drag and Drop and Multi-choice. 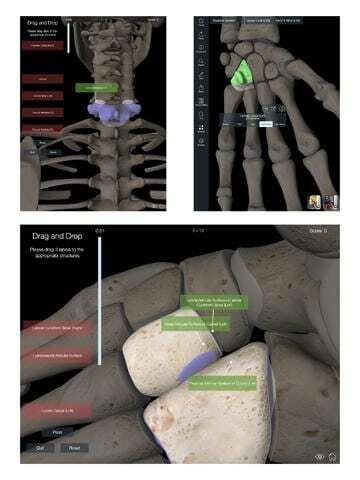 I downloaded this app a few days ago and iI enjoyed playing with it, I used my Ipad Mini 2 to see its performance and I have to say its very responsive and accurate, with specific details even to the finger bones. 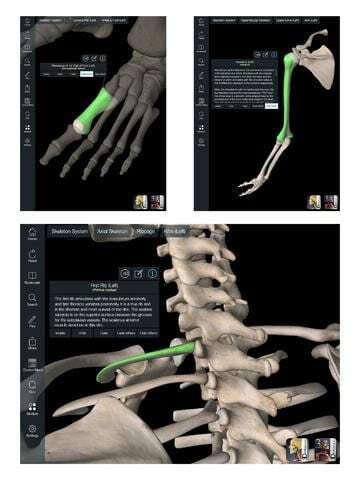 I consider this app a very good way to visualise the skeletal system, but because this is the free version ( paid has all the systems) there isn’t really any explanation for the attachments , nerves or related systems its more of a reference of the bones location and name, thus for a student its helps visualise the the bones but needs a text book to actually get more details of the related structures. Being free even with its basic information is really amazing 3D4Medical, really out did themselves with this app, with features like sharing, writing , quizzes. Try the Quiz, its a drag and drop game where you have to pull the tag from the left side on the the correct bone or cartilage. Also, the dental anatomy part is really basic. This App is great to visualise the location of all the bones in the body, but with the lack of the medical details and just presenting the basic data, its more of an aid than a refrence source, Still its pretty awesome to see the angulation of the teeth in the mouth .